Learn the magic of using stencils and a small roller to create multi-layered monoprints in this relaxed workshop. 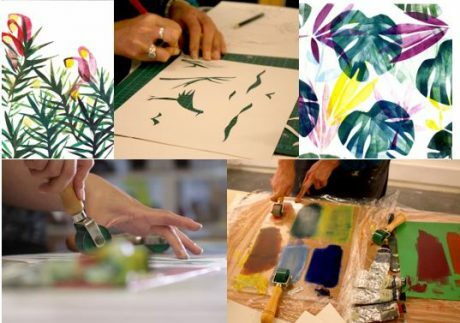 Artist Sophie Rae, will show you how to mix vivid printing inks and apply them to paper/card, utilising hand cut stencils to create abstract patterns, marks or simple designs, which can be applied to a number of flat surfaces. To see examples of the process and work you can make visit: www.sophie-rae.com. This workshop will allow you to play with the materials, which give satisfying, quick results. There is no printing press in sight, so it’s easy to do on a small table at home. Suitable for complete beginners. There will be the opportunity to print festive designs onto cards and gift tags, just in time for Christmas!